Decorated YETI mugs are the hottest product in personal customization these days. Or, you could say it’s the coolest thing going. It all depends on whether you’re using one to keep your latte hot or your iced tea cold. But the reason our customers love YETI mugs is not because of what goes on inside, but because of what goes on outside. Which is vinyl graphics. We’ve been getting questions almost every day about how to apply vinyl decals to YETI mugs; What kind of vinyl works? Can I use my vinyl cutter, or do I need a mug press? Heat transfer film or sign vinyl? Can you put it through a dishwasher? Do you have glitter or blingy vinyl for a YETI? Chill out, YETI fans. The answers to all of your fevered questions are just below the break. Sign Vinyl: No heat required. SignWarehouse offers several self-adhesive ‘sign vinyl‘ films that can be used to decorate YETI Rambler stainless steel personal drink coolers. I say ‘sign vinyl’ because some aspiring drinkware decorators have gotten this mixed up with heat transfer film, aka ‘T-shirt vinyl’ and are asking how to put HotMark on tumblers. Heat transfer film is made for application on apparel, not hard metallic substrates. This is a job for a vinyl cutter and some good old vinyl and transfer tape. No heat transfer or heat press is required. Speaking of vinyl, we have options for every taste, ranging from mild to wild. In that order, we present four tested YETI vinyl decoration options. EnduraGLOSS is our popular private label sign vinyl. It’s a glossy 3 mil, intermediate calendared vinyl with a permanent, acrylic adhesive. Like most of our vinyl films, EnduraGLOSS is engineered primarily for signs, banners, and other commercial graphics. It works best on flat surfaces and simple curves, and comes in 40 colors, including two matte and two metallic colors. 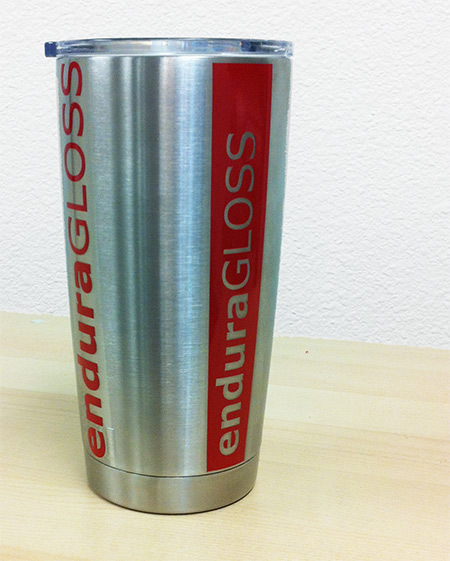 We tested EnduraGLOSS on a 20oz YETI Rambler. We chose #536 Cranberry to achieve a nice contrast with the mug’s silver metallic finish . The YETI Rambler is made from 18/8 stainless steel with double-wall vacuum insulation. We used medium tack TransferRITE 582U to transfer the decal to the mug. The YETI Rambler is a fairly smooth surface, but it is brushed stainless steel, so it’s not as easy for the adhesive to wet out or bond to. It’s not as problematic as low energy plastics like polypropylene, but it does take some time for the acrylic adhesive to wet out and form a permanent bond. The best way to apply EnduraGLOSS to a YETI Rambler is to apply it dry -no application fluid – with firm pressure from a good quality squeegee. Allow about 15 minutes before trying to remove the transfer tape. To assist in proper placement of the decal on the Rambler, a hinge method might be helpful. This will allow you to position the decal exactly the way you want it before you expose the adhesive and squeegee it in place. For more information about using hinge methods, please refer to our blog article or view our Basic Vinyl Application DVD, available on SignWarehouse TV. Once the decal has been applied, the adhesive is set, and the transfer tape is removed, it looks like you’re done. But the adhesive bond is still building. It’s a good idea to allow at least 24 hours before you wash the mug. More on that down the page. 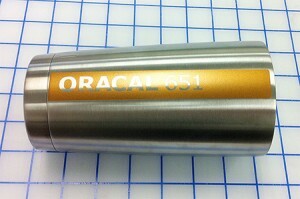 FIG 2: ORACAL 651 Copper Metallic looks refined on stainless steel. 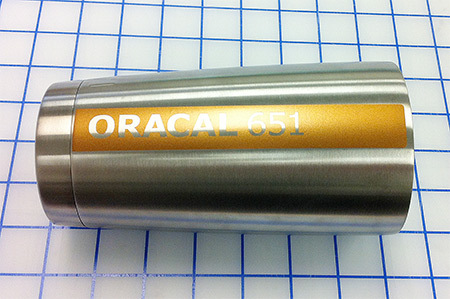 We also tested ORACAL 651 #92 Copper Metallic. The metal flake content in ORACAL 651 Metallic colors is subtle. It’s a perfect compliment to the brushed stainless steel finish of the YETI Rambler. The same would be true of EnduraGLOSS #550 Gold or #551 Silver. ORACAL 651 is a 2.5 mil, intermediate calendared vinyl with excellent gloss and a permanent solvent adhesive. Because 651 has a fairly stiff face film, it works best with high tack tape. We used a high tack paper tape and the ORACAL Flip Tip and had no issues with removing it from the release liner. The decal was applied using Ye Olde Hinge Technique with firm pressure and a good squeegee. ORACAL’s solvent adhesive bonds more quickly to the Rambler’s stainless steel walls, so we were able to remove the tape almost immediately afterward. The metallic finish of the Copper on Stainless steel is understated, yet elegant (FIG 2). We’ve gotten lots of questions about ‘glitter’ on YETI mugs. So to achieve a glitter effect, we did an Emeril and kicked it up a notch. The preferred glitter vinyl for a YETI Rambler is our new Endura GlitterCAST Ultrametallic vinyl. 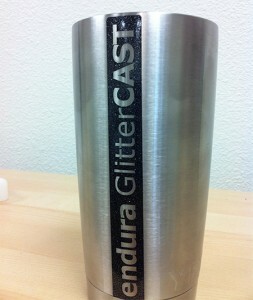 Endura GlitterCAST is a 3mil cast vinyl with a high metal flake content in the face film. It’s comparable in appearance and performance to Avery UC900 Ultrametallic vinyl. The visual effect is a significant step up from a calendared metallic or even a cast metallic vinyl. GlitterCAST has a permanent, acrylic adhesive. To achieve a distinguished look and maximum contrast with the stainless steel, we chose #7591 Smoky Quartz, which could be described as Black with brilliant silver flakes in the cast face film. Speaking of cast vinyl, this is a good time to talk about compound curves. Compound curves are surfaces that curve in more than one direction. Obviously the mug is cylindrical. But since, the top is wider than the bottom, it’s curving in two dimensions at once. Applying calendared vinyl on more than a 2″ – 4″ wide swath of the mug may challenge the face film and cause some lifting or shrinking over time. 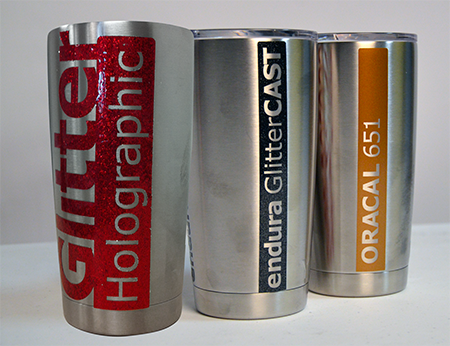 Endura GlitterCAST has better dimensional stability and adheres better to compound curves than calendared vinyls. This means you can design wider decals with Endura GlitterCAST than would be advisable with EnduraGLOSS or 651 (Fig 3). Because the YETI Rambler’s brushed stainless steel is a bit of a low energy surface, we opted for medium tack TransferRITE 582U here, just as with the EnduraGLOSS. It’s unwise to use high tack tape to transfer a vinyl graphic to a low energy surface or to apply a vinyl with a low-tack removable adhesive. For a more detailed explanation of this principle, please click here. Apply with firm pressure from a good squeegee. And because Endura GlitterCAST has an acrylic adhesive, you’ll need to allow sufficient time for the adhesive to wet out before removing the transfer tape. About 15 minutes should work. The result is an impressive glitter effect that looks stunning on the stainless steel Rambler. FIG 4: For maximum impact, try Schein Glitter Holographic. When people ask for ‘glitter’, some of them are thinking about glitter or bling heat transfer film, which is at the top of the chart for eyeball-poppin’ graphics. 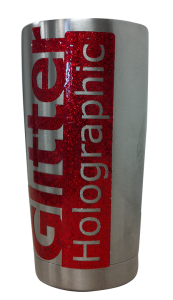 Our Schein Glitter Holographic occupies that spot in our product line. It has as much metal flake as our EnduraTex Bling or Siser Glitter heat transfer film. So, if you’re looking for a standard vinyl that looks like Glitter T-shirt vinyl, this is your stop. Compared to Endura GlitterCAST, the Schein Glitter Holographic has about the same number of metal flakes, but they’re much larger. The effect is weapons-grade glitter vinyl. However, the basic rule with metal flake in vinyl is the more you add, the more you lose. There are tradeoffs involved. Schein Glitter Holographic is a metallized PVC film made by the same mad scientists who produce Schein diamond plate, Chrome Polish and other brilliant films. It’s a 3mil embossed metallized PVC film with a permanent acrylic adhesive. The Schein Glitter Holographic face film is absolutely jam-packed with metal flake. So it takes a little more care when cutting and weeding. If you weed it as aggressively as you would EnduraGLOSS or 651, you may tear the vinyl. You may also notice some tunneling as you unroll the film and place it on the cutter. Not to worry. It won’t interfere with the plotter blade. You may also notice some that some of the metal flake will get transferred to the substrate outside the vinyl itself. We had some of these around the edges of our decal on the Rambler. We scraped them off with an Olfa knife, taking care not to scratch the mug. 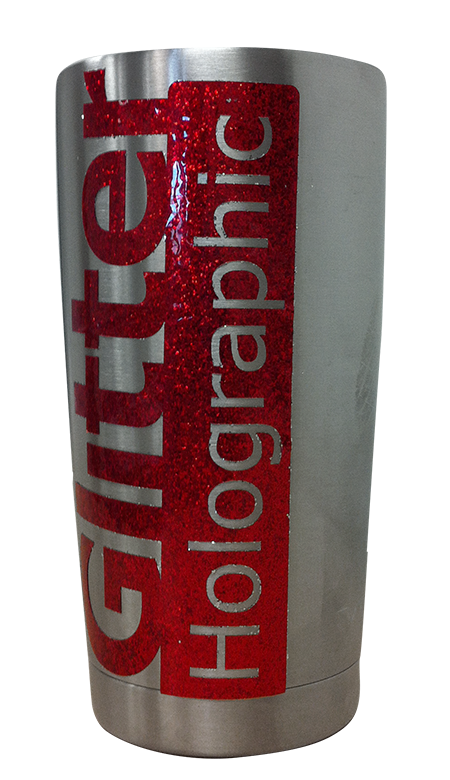 To get the maximum visual effect of this eye-popping film on the YETI stainless steel mug, we chose Schein Glitter Holographic in Cherry Red (Fig 4). If you’re gonna be a bear, be a grizzly. A glitter grizzly? The general rule for transferring holographic vinyl is to use high-tack tape. But, for this application on a low energy surface, we opted for 582U. Using the same techniques as listed above, we applied a big, bold Cherry Red decal on a YETI Rambler with firm pressure and a good squeegee. 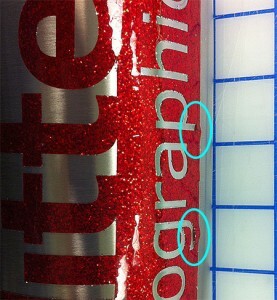 Because the Glitter Holographic has an acrylic adhesive, we gave it about 15 minutes for to bond to the Rambler. FIG 5: Edge Lifting here is caused by the metalized face film and too large a decal. Metallized PVC films are near the opposite end of the conformability spectrum from cast vinyl. They’re not designed for compound curves. Adding this much metal flake makes it even stiffer. So this is not the first choice for decorating curvy mugs. Schein Glitter Holographic is happiest on flat surfaces and simple, moderate curves. Commercial storefront windows, yard signs, box trailers, things like that. So we were not surprised to see that the edges of the graphic were lifting (FIG 5). Too much metal on too extreme a curve will do that. This doesn’t mean you can’t use Glitter Holographic on a YETI Rambler, or any other drinkware item. It just means you have to keep the design slim and simple. Avoid small elements like filigrees and avoid trying to wrap it around too much of the mug. So each of our test mugs was hand washed. We allowed 24 hours for the adhesive to bond, then hand washed each one in hand soap or dish detergent and hot water. There was no lifting and no damage to the decals (Don’t use abrasives like brillo or scotchbrite pads. They may scratch the vinyl). If hand washed in mild detergent, and dried immediately, your glitter YETI graphics should wear well. If soap and water is allowed to get trapped under the vinyl edges, the decal may fail. This is especially true with Schein Glitter holographic, which has a layer of metal foil under all that bling. 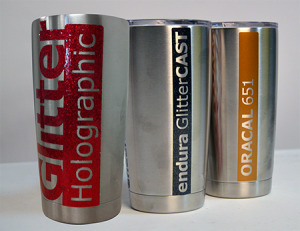 So, if you or your customer are gaga about glitter, you can create and apply blingy vinyl decals to your YETI Rambler or similar drinkware items. With EnduraGLOSS, ORACAL 651, Endura GlitterCAST Ultrametallic, and Schein Glitter Holographic, you have design options ranging from mild to wild. Just remember to keep the adhesive properties in mind when choosing a transfer tape and deciding when to remove it. If you go for the nuclear option and put Glitter Holographic on a Rambler, make it slim & simple. Hand wash them with care to keep them looking really hot or really cool – depending on whether your YETI is loaded with java or iced tea.